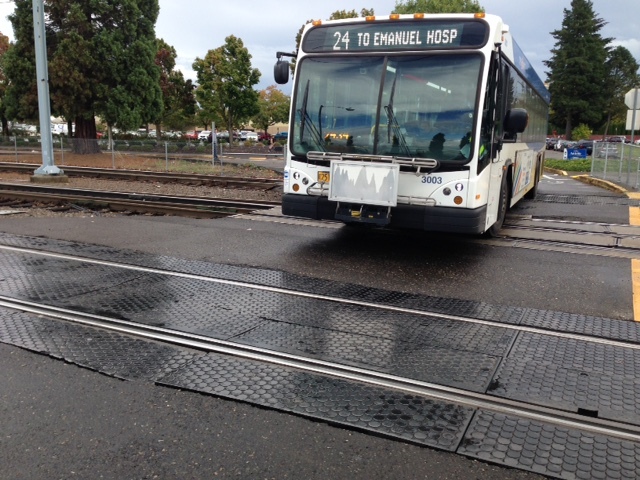 TriMet will be making improvements to a rail crossing at Gateway Transit Center November 16 and November 23, 2014. The work will provide a smoother ride for MAX and bus riders, as well as create an improved crossing for pedestrians and bicyclists, but it will require a one-day disruption for MAX trains on Sunday, Nov. 16. Crews will replace rubber panels with a more durable concrete structure. The improvements will cost about $261,000 and are part of TriMet’s ongoing investments to ensure our system remains safe and efficient for years to come. MAX Blue, Green and Red Line service will be disrupted on Sunday, Nov. 16. Shuttle buses will provide connections between Gateway Transit Center and MAX stations. Green and Red Line service will be adjusted for the day, and trains on all lines will run less frequently. Those traveling through the Gateway area should plan an extra 15-30 minutes. TriMet staff will be on hand to help, and signs will direct riders between trains and shuttle buses. Shuttle buses will run between Gateway Transit Center and E 102nd Ave MAX Station. At E 102nd Ave MAX Station, transfer to the shuttle across the street from the westbound platform. Trains will be running every 20 minutes instead of every 17 minutes most of the day and every 40 minutes in the early morning and late night. Green Line trains will only run between Clackamas Town Center and SE Main St stations. 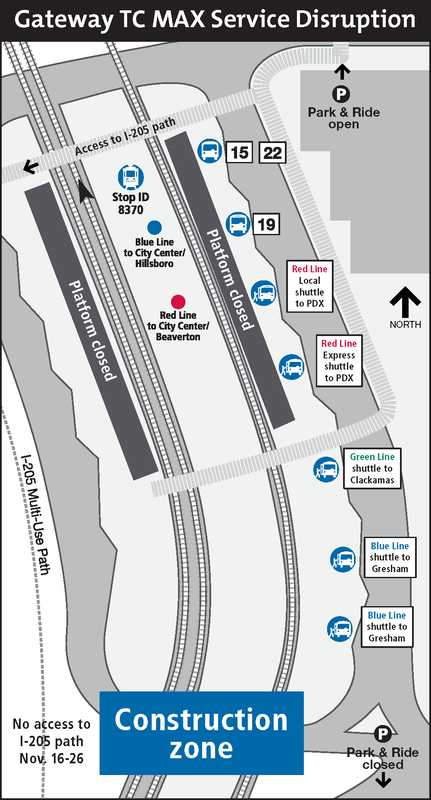 Use Blue or Red Line trains between Gateway Transit Center and Portland City Center. Shuttle buses will run between Gateway Transit Center and SE Main St MAX Station. At SE Main St MAX Station, transfer to and from the shuttle near the Line 15 bus stop at SE Main & 96th. Local and express shuttle bus service to the airport will be available from Gateway Transit Center. Local shuttle buses will serve all stations between Gateway Transit Center and Portland International Airport. Express shuttles will travel directly to the airport from Gateway Transit Center with no stops in between. At the airport, transfer to and from the shuttle outside of baggage claim near the MAX station. Red Line trains running between Beaverton Transit Center and Gateway will be running every 20 minutes instead of every 17 minutes most of the day and every 40 minutes in the early morning and late night. 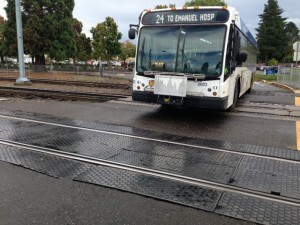 Yellow Line service will continue to run as regular between Expo Center and Portland City Center. However, trains will come every 20 minutes instead of every 17 minutes most of the day and every 40 minutes in the early morning and late night. Plan ahead: Allow an extra 15-30 minutes for trips. Check TriMet’s Trip Planner to see if regular bus service may be a travel option. Shuttle buses will be running regularly between stations. Shuttle buses can only hold two bikes at a time. Don’t worry about showing fare to the shuttle bus operator. In the Priority Seating area at the front of the shuttle bus, move for seniors and people with disabilities. Sunday, Nov. 16 and Sunday, Nov. 23, buses will run on a different route through the transit center. Line 22-Parkrose buses will use the Line 15 stop. Lines 15-Belmont/NW 23rd and 19-Woodstock/Glisan will pick up riders at their regular stops. Buses will run on their regular schedules. Sunday, Nov. 16 through Wednesday, Nov. 26, access to and from the I-205 multi-use path at NE Pacific Street will be closed. Signs will direct pedestrians and bicyclists to the NE Multnomah Street access path. Please walk bikes in the transit center. Saturday, Nov. 15 through Sunday, Nov. 16, the Park & Ride lot south of the transit center will be closed. Northeast Pacific Street west of NE 99th Avenue will be open only to TriMet and construction vehicles. Use the parking garage north of the transit center. For safety, do not use the entrance on NE Multnomah Street. Instead enter and exit from the entrance on the north side of the garage. Please be aware of increased bus and bicycle traffic in the area. Information about the Gateway project can also be found at trimet.org/gateway.